I recently had a discussion about posting links to Facebook groups (ie. via Flickr) instead of posting directly to Facebook. Some Facebook group owners don’t like links being posted, maybe because links are traps for unsuspecting users to have their hard drive wiped, their bank accounts emptied and their children sold to slavery? What’s actually wrong with posting a link to (for example) a Flickr.com page where a large thumbnail of the picture appears in the Facebook post anyway? Did you know that by uploading/posting photos and videos to Facebook gives Facebook a license to use your content in any way it sees fit? And the license goes beyond that – it can transfer or sub-license its rights over a user’s content to another company or organisation if needed. More on, Facebook’s license does not end upon the deactivation or deletion of a user’s account. As a professional photographer I’ve had images stolen and used without my permission so I tend to put watermarks on my pictures where possible (not that it’ll stop people determined to steal your image). And usually instead of uploading them directly to Facebook I link them to an external photo sharing website which is free to use and more importantly is also safe to use. If the owners of these groups insist that pictures have to be uploaded directly then surely they must also ensure to warn their users about Facebook using your pictures as it sees fit? It seems that my pictures which ran in The Whitehaven News have provoked a good reaction! Page 10 of this weeks’ paper (23rd December 2009) features letters from the public who having seen my pictures are backing up the plea to re-open the cinema, especially in light of the Workington bridge disaster which makes it difficult to get to the local multiplex. 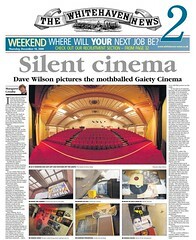 There is even a Facebook group called Re-open the Gaiety Cinema – please join up! This is a link to the feature on the Whitehaven News’ own website. Here’s a jpg copy of the feature in The Whitehaven News (hosted on Flickr). Here is a link to The Whitehaven News letter page.